It is a commonplace that one can become like one’s adversary. Sometimes the mimicry is especially arresting. 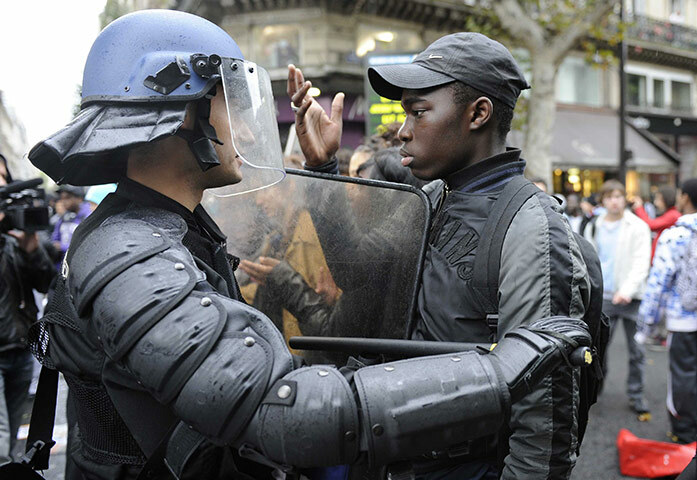 This confrontation between a student and and a police trooper occurred during a demonstration at the Place de la Republique in Paris. The place name is significant, for the gendarme and the student stand as two sides of the republic: the administration of its laws, and the citizens they are to serve. That mutuality is signified by their commonality in costume and stance: The black, zipped up jacket mirrors the black uniform, as hat mirrors helmet, erect posture is balanced by erect posture, and extended right arm is matched by the raised right hand. Each is impassive, and together they form an almost classical tableau; if one had the right narrative, one could imagine them as a commemorative statue in the public square. The similarities are not the end of the story, however, for they also underscore the differences. Black and white, to be sure, and also force and speech, for the one holds shield and club while the other’s hand assumes an elocutionary gesture. Yet both are restrained: force used only to block, speech not yet voiced. What is most striking is that law enforcement appears so alien–as if the carapace of body armor were the outer shell of something no longer wholly human. And so the matching coloration also becomes disturbing, as if the citizen also were becoming deformed by their co-evolution in the 21st century. What saves them, for the moment, is the near-perfect stasis of the image. Neither is moving or likely to move, and at the end of the day the photograph may be recording a relationship of respect. Each is equipped for their respective roles in the demonstration, yet they still stand as equals. As that is one of the dearest principles of civic republican government, this may be a picture of political sustainability. If you live in the US, you know the drill. 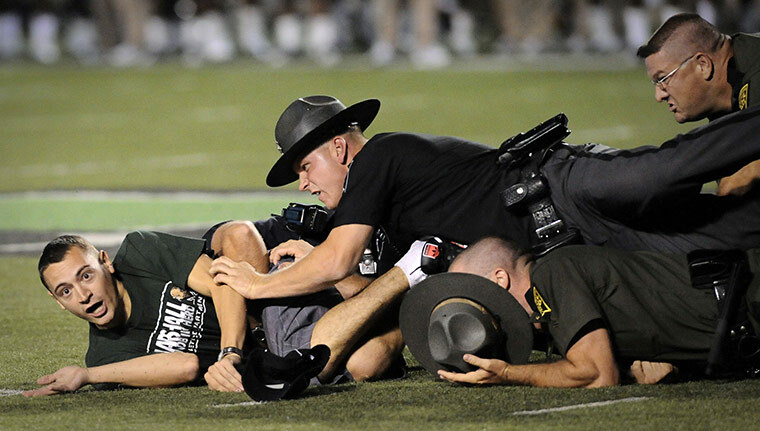 A fan has run onto the field during a football game, and the troopers assigned to the tough detail of providing security–i.e., watching the game from the sidelines–have run him down and tackled him. The fan’s behavior is intentionally comic–a silly stunt done on a dare or, more likely, just for the hell of it. The cops’ behavior is unintentionally comic: they pile up like a bunch of Barney Fifes, probably picking up an injury or two, with hats (symbols of authority) flying and their guns and other equipment useless at best (you have to hope that nothing goes off). The parodic doubling of the actual (official) game makes the scene all the more carnivalesque, which is one reason it fits into the larger spectacle. And speaking of fit, did you notice how fan and cops mime one another? The intensity of the fan’s expression is mirrored by the other two faces that we can see, just as their bare arms, skin tones, and haircuts mirror his, and even his casual clothes seem similar to their uniforms, and they all are jumbled up together anyway. The cops probably aren’t drunk, so that could be one difference, but, as above, the similarities suggest a common culture. And so the real difference is not within the photograph but between the two images: one serious and the other a study in mindless distraction. In one, the state is the subject of politics, and in the other, the state provides rent-a-cops for the entertainment business. Neither culture is perfect: in one, the cops appear alien even when behaving with respect; in the other, the cops appear thoroughly human but hapless. The important point is that these photos aren’t really about the cops at all. They depict two very different conceptions of what it means to be a citizen. Photographs by Gonzalo Fuentes/Reuters and Jeff Gentner/Associated Press.